So this week Provo Craft had a sneak peek of the new Create a Critter 2 cartridge. They allowed 5 images to be revealed on the Cricut Craft Room for Crafters to use and create with for a few days. The best part…. make a project, post it on the Cricut Project Center and be entered to win access to the WHOLE library of cartridges on the Cricut Craft Room. Can you believe that?! Crazy! 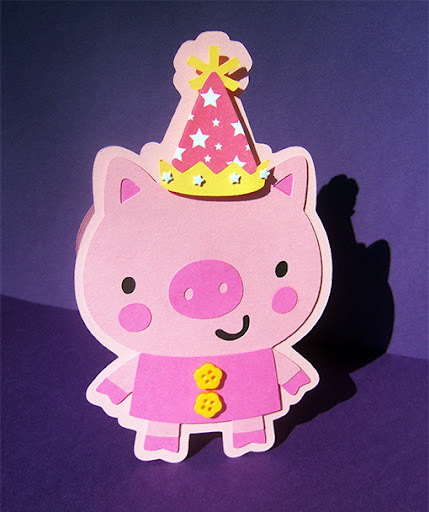 I call him Happy Piggy Party. 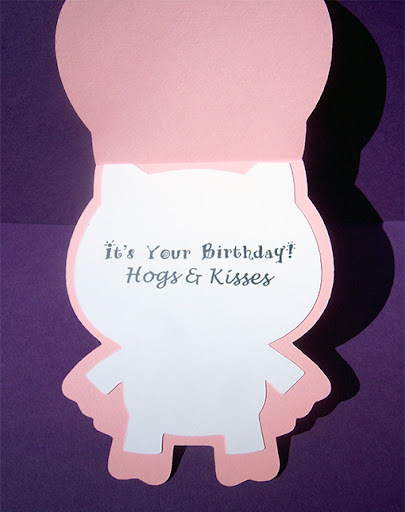 Using the Create a Critter 2 cartridge I cut 2 Piggy Shadow layers at 6″. Then scored one shadow layer at the base of the pig’s ear, folded and adhered to the other shadow layer, this made my card base. I cut the remaining layers and adhered them together. I paper pieced the hat with pink and white star patterned paper and added some white mini star brads. I also used 2 yellow flower buttons with Glossy Accents. For the inside of the card I cut 1 more layer but this time I hid the contour lines to leave me with just a outline. I then used Pink By Design’s Simply Everything and Country Living stamp sets for the sentiment. I will be linking this to the Sarah Hamer’s Link Up Tuesday. Check out what everyone has been busy crafting away to this week.